Resilience is one of the components of durability, the ability to sway within life. Despite what we might wish for ourselves we know it’s pretty unrealistic to expect to have a perfectly serene life, devoid of stress, drama or disappointments. Therefore if we’re smart we can build in protections so when the winds of misfortune howl we don’t collapse into depression or addictive behaviours… but instead we sway with it. This is durability: swaying and coming back to center, after life deals you a blow. You can see why durability is important. Without it any periods of stability in your life will feel tenuous. You’ll find yourself hanging in there until the next overwhelming thing comes along, before you descend into depression or addictive behaviours. Our experience of relapse tells us that it doesn’t just happen – it’s is a process and follows a sequence. Yet there is a trip-wire which sets it in motion, and that is some type of overwhelming circumstance from which you never quite regained your balance. Do you see where durability fits in? If you were not durable, you bent, you broke, and you stayed broken. The components which make up our durability are 1) a strong foundation, 2) contingencies, and 3) resilience. 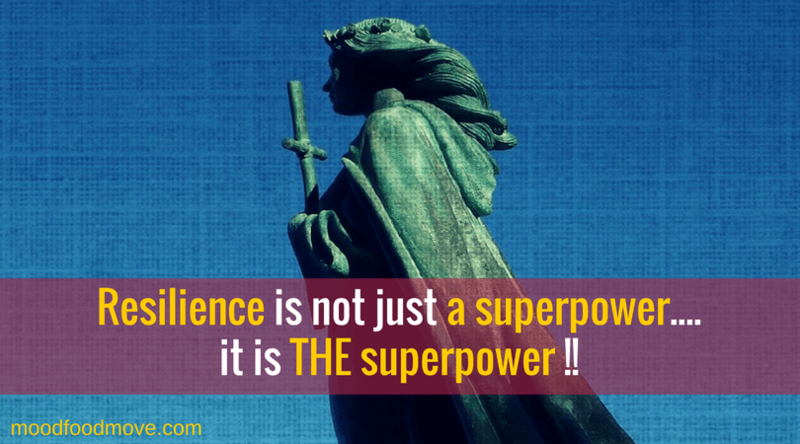 If you are prone to depression and addictive behaviour I believe the component (superpower!) you should focus the most effort on developing is Resilience. 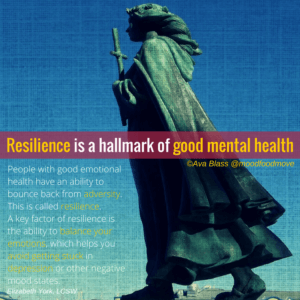 It’s Resilience which reinforces a stable base on which to build a happy and balanced life. Resilience brings you back to center. We’ll focus on resilience for the rest of this article. As adults your innate resilience is not fixed, and can be built up. And this is something that you will want to do because resilience is a valuable life skill which has the ability to transform the quality of your life. Resilience enables us to develop mechanisms for protection against experiences which could be overwhelming, that might otherwise have lead to a prolonged nose-dive into relapse. As your resilience grows you’ll experience increasing longer periods of calm as a result of learning to quickly slot back into routine, rather than have each successive challenge pile atop the previous one. Yes, you will encounter periods of Reprieve (!!) – something those of us prone to depression and addiction would rarely enjoy. The buffering that resilience affords us comes from it being protective. It’s got your back, it has you covered. Good resilience can compensate for the failure to look ahead that result in poor contingencies. And then subsequently finding yourself in a non-ideal situation, with your mood or sobriety compromised. But by being resilient you are able to bounce-back quickly, and return to your core routine. So that disruption didn’t progress into a major or protracted derailment of your mood or sobriety. Resilience will also compensate for the weak foundation that an unhealthy lifestyle creates. Those late nights, processed food, or lack of exercise are not conducive to feeling good physically or psychologically – meaning you’d find yourself more prone to stress or getting lost in dramas and sagas. Whilst you can’t expect to advance in your recovery if you have destructive lifestyle habits, being resilient can keep the dam from breaking. Instead you’ll be able to dust yourself down, move on, get back on the program quickly. 3. Resilience reminds you I-Can-Do-This!! Perhaps where resilience has its greatest impact is on your psychological wellbeing. Whenever you get a couple of days of being on track under your belt your self-confidence goes up. There is a positive feedback loop between each successful bounce-back and your feeling of I-Can-Do-This!. The little confidence boosts that arise from each success, add up. I call those little successes “half-a-percents”. Life improves as those little half-percents accrue, because life gets easier when you believe in your abilities. Resilience is the route to liking yourself through its positive influence on your bruised and tattered self-esteem. Low self-esteem is endemic in addiction and depression. It’s a risk factor for both conditions, as well as being exacerbated when depression and addiction symptoms take hold. It’s possible to escape the low self-esteem pit, because self-esteem is directly proportional to what you do. Every time you learn a new skill, your self-esteem goes up a little. Every time you achieve something, your self-esteem goes up a little. And equally… every time you successfully bounce-back from a low place and get back on-track your self-esteem goes up a little. Don’t undervalue the importance of each small success. It is through them that you will develop a gentle pride which tells you that you’re OK – and you can do this. So this is why Resilience is the superpower people prone to depression and addiction need to most work on. I hope that you can see how important it is. A future article will feature the many ways that you can build your resilience. Take this quiz: How Resilient Are You?